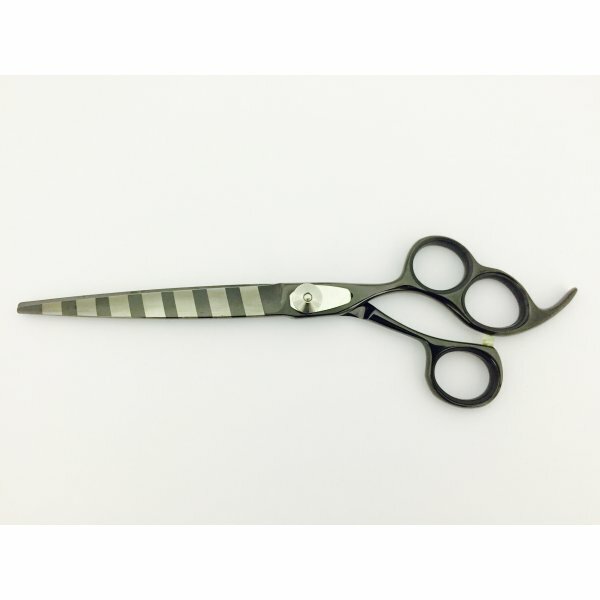 The Excalibur X01 Straight Grooming Scissor is one of our more popular dog grooming scissors with its unique extra finger hole allowing for a natural grip and scissor position within your hand. This consequently gives you more control whilst delivering an ultra sharp cut. Finished in a stylish gun metal black with contrasting tungsten striping. The steel tensioner creates extra resistance for the perfect individual feel. Complete with display case, cleaning oil and cloth. 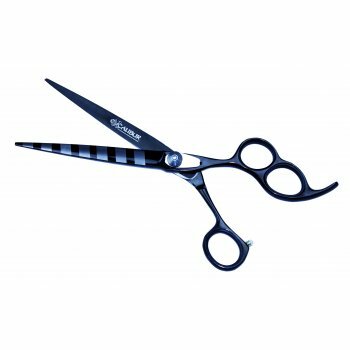 All Excalibur Dog Grooming Scissors are ultra heat treated and sub-zero quenched Japanese 65 HRC cobalt stainless steel. The titanium infusion is a unique process, which will help maintain the razor sharp edge of your scissors blades. At Splendid Pets, we realize that choosing scissors can be difficult without actually feeling them for yourself. Should you order a pair of scissors and find for whatever reason, they don't feel right, you may return them unused within 10 working days of ordering for a full refund of the scissors' purchase price.